With so many projects now requiring a BIM model for coordination and life cycle management, it's crucial to understand the capabilities of your software when it comes to collaboration and file sharing. What's most important to know is this: SDS/2 can create the file types you need to transfer your manufacturing model to software products like Autodesk® Revit® Structure and Navisworks. This article will give you the information you need to conquer your next BIM project, including the most commonly used file types, such as DWG and CIS/2, and their benefits and drawbacks. You'll also learn about the latest file transfer option, the direct Revit import/export available in SDS/2 Connect. First, the basics: BIM is not any single software or file type; it is the model that contains and can communicate information through various file types. When working on a project with BIM requirements, your life will be infinitely easier if you know the model origin point before you start your model. While models can be relocated and reoriented through the model transfer process, it's easier to start with the correct point than change it later. Finally, communication that starts early and occurs often on the project will contribute just as much to the success of the project as will the right file type. Kick-off meetings are a great example of this. The U3D and VRML file formats provide users with a great tool for visually representing a project. U3Ds are typically embedded in PDFs and are meant for communicating RFI information; VRMLs are generally used to generate 3D objects in the digital model. In SDS/2 v7.241 and higher, users have the ability to rotate the model, show insertion point, and include welds, holes or bolts when generating VRMLs. However, it must be understood that these file formats are not designed for transmitting key information on a project. On February 15 at 10:30 a.m. CST, Design Data will host a free, live webinar on BIM File Formats in SDS/2. 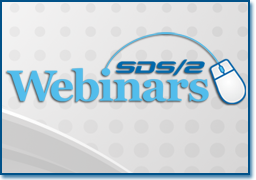 This training webinar will provide an in-depth look at three of the file formats used for import and export to and from SDS/2: VRML, CIS/2 and IFC. Users will learn the difference between the file formats, and what is contained in each; they will also learn how set-up options affect certain exports, and what to expect from the set-up options in the three file types. In addition, the webinar will also feature a BIM demonstration, with a file import into SDS/2 and an export out of SDS/2 into another software. Did you know the SDS/2 by Design Data YouTube channel contains more than 50 videos related to SDS/2 and SDS/2 Connect? Unlike the training videos featured on the sds2.com site, which require a current web login to access, the videos on YouTube are viewable by the public at large. Video categories include BIM, SDS/2 Connect, SDS/2 Detailing, SDS/2 Project Spotlight and Partners. The newest category is Global Review Training - Statusing, which contains videos related to the Global Review Station and SDS/2 Approval, including how to create and use Status Display in SDS/2. Videos are being added weekly, so be sure to subscribe to the SDS/2 by Design Data channel to be notified when new content is posted. Design Data recognizes that our customers are our most valuable asset. As we launch SDS/2 Connect, we want to work together with our customers to spread the word about SDS/2 Connect among the engineering community. To help reach that goal, Design Data is sharing the opportunity to profit from SDS/2 Connect with all our customers. Together, we can make a difference in driving projects downstream to SDS/2 detailers and fabricators. On your upcoming projects, encourage engineers using Revit Structure to buy the SDS/2 Connect add-in and we'll send you our thanks—in the form of $250. More important than the financial benefit, SDS/2 Connect will provide engineers with a direct API format to transfer their models to the detailer and the ability to roundtrip detailing changes back to the engineer's model. Remember, with SDS/2 Connect's incredible round-tripping capabilities, even if the engineer leaves the connection design to you, everyone will benefit from the round-tripping of the model. The Revit Structure model will be more accurate and the connections that are designed by the detailer become visible in Revit Structure with the SDS/2 Connect add-in. To earn your referral bonus, the engineer must enter your name as a referral during the purchase process on www.sds2connect.com/purchase. Customers will earn $250 per company that the customer refers. The name on the referral cannot be the same as the person or company purchasing SDS/2 Connect—in other words, you can't refer yourself. To learn more, contact sales@sds2.com.